I had an amazing opportunity this week to take a seaplane from Sausalito to Lake County to taste some wines, an experience I'll write about in more detail a little later. On the way back we flew right over the Mayacamas mountain range, which extends from Napa County into Lake County. That's St. Helena in the top of the photo. Sorry it's not a better shot; it was taken with my Canon pocket camera through a seaplane window. What struck me the most was how wild Napa County looks from above. The mountains surrounding Napa Valley are rugged land, seemingly untouched by human habitation. I've been to Napa dozens of times, and driven up most of the mountains, but the perspective from the air was still amazing. From Highway 29, you just can't imagine how wild most of the county really is. Other things that struck me: southern Sonoma County is really dry; the only green you see in some areas are vineyards that are obviously irrigated. A bunch of tiny cattle gathered around an artificial watering hole at Clover dairy farm on land that didn't seem to have anything at all for them to eat. It's a huge contrast from the tree-covered mountains just a few minutes' flight north. The wall at San Quentin beside the baseball field doesn't look like it would be hard to scale. The seaplane pilot helpfully pointed out nearby towers with sharpshooters. Just before you get to Lake County proper, you pass over a fascinating energy generation system, with pipelines snaking from geysers all over the mountains to steam turbines. You also pass over a big nudist resort. But we didn't bring binoculars. You can't land a seaplane in Napa County anywhere except Lake Berryessa, which is a little out of the way. So Lake County is a much better destination, because you can dock right next to a wine tasting room. Seaplane Adventures sells a 1-day roundtrip from Sausalito to Ceago Vinegarden in Lake County for $575 a person. We landed at Ceago, which gets lots of visitors by boat on weekends, and enjoyed lunch with Ceago owner Jim Fetzer. Everything came from his certified biodynamic property, including the lamb that had fattened itself on the cover crop for his vines before being grilled in the open-flame oven. Lavender was being harvested, and after we watched it distilled into aromatic oil, we had lemon bars with lavender and a delicious lavender honey cake. 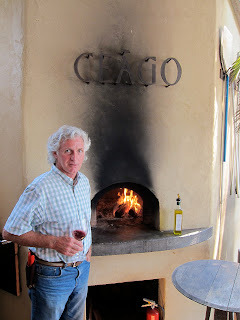 I particularly liked Ceago's unoaked Chardonnay, which was lively with plenty of stonefruit flavor and very refreshing on a 99-degree day. "I hate oak on Chardonnay," Fetzer says. I don't always agree, but when the grapes are as vivacious as his, he's right: why hide all that character? This little adventure is not cheap, but neither is a visit to Napa Valley these days. I would totally recommend it for the wealthy tourist looking for a new way to enjoy wine country. You can book a Seaplane Adventure here. Bon voyage.